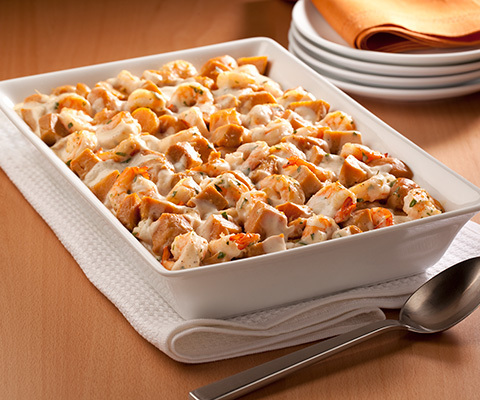 In a large bowl, combine shrimp, potatoes, Classico® Light Asiago Romano Alfredo Pasta Sauce, parsley and nutmeg. Transfer into a 7x11 baking dish and bake about 25 minutes, or until sides are bubbly and top begins to brown. If desired, substitute Classico® Spicy Tomato & Pesto Pasta Sauce with Classico® Spicy Tomato & Basil Pasta Sauce. TIP: If desired, prepare meatballs ahead of time, up through Step #1. Cover and refrigerate until ready to cook. I followed the recipe and it turned out great...my family loved it!